This page is about the English city. For other uses, see Winchester (disambiguation). 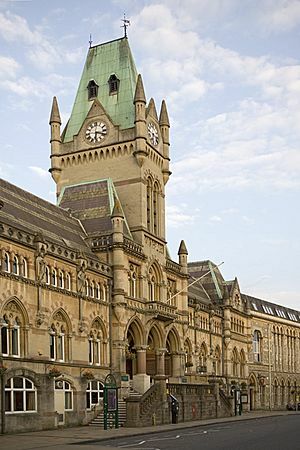 Winchester is a city and the county town of Hampshire, England. 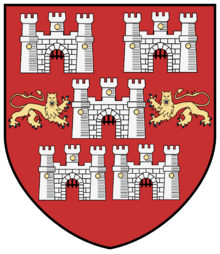 The city lies at the heart of the wider City of Winchester, a local government district, and is located at the western end of the South Downs National Park, along the course of the River Itchen. 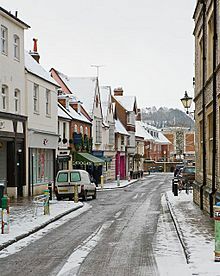 The area around Winchester has been inhabited since prehistoric times, with three Iron Age hillforts, Oram's Arbour, St. Catherine's Hill, and Worthy Down all in the nearby vicinity. In the Late Iron Age, a more urban settlement type developed, known as an oppidum, although the archaeology of this phase remains obscure. It was overrun by the confederation of Gaulish tribes known as the Belgae sometime during the first century BCE. It seems to have been known as Wentā or Venta, from the Brittonic for "town" or "meeting place". Following the Roman withdrawal from Britain in 410, urban life seems to have continued at Venta Belgarum until around 450 AD, and a small administrative centre might have continued after that on the site of the later Anglo-Saxon palace. Ford identifies the community as the Cair Guinntguic ("Fort Venta") listed by Nennius among the 28 cities of Britain in his History of the Britains. Amid the Saxon invasions of Britain, cemeteries dating to the 6th and 7th centuries suggest a revival of settlement. 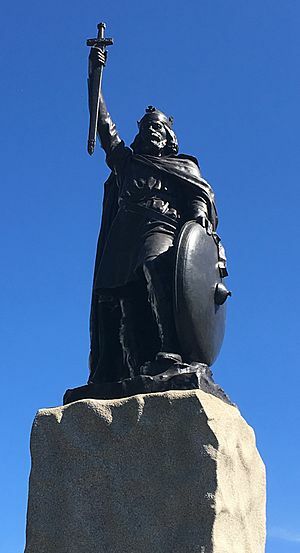 The consensus among historians of Anglo-Saxon England is that the court was mobile in this period and there was no fixed capital, but Winchester is described by the historian Catherine Cubittt as "the premier city of the West Saxon kingdom." The Winchester Buttercross (Sept. 2010). 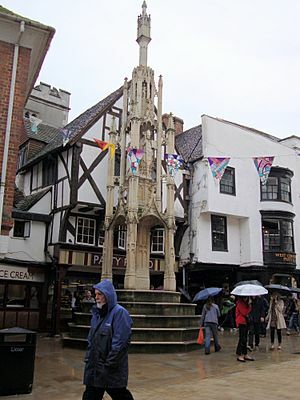 The City Cross (also known as the Buttercross) has been dated to the 15th century, and features 12 statues of the Virgin Mary, saints and various historical figures. Several statues appear to have been added throughout the structure's history. In 1770, Thomas Dummer purchased the Buttercross from the Corporation of Winchester, intending to have it re-erected at Cranbury Park, near Otterbourne. When his workmen arrived to dismantle the cross, they were prevented from doing so by the people of the city, who "organised a small riot" and they were forced to abandon their task. The agreement with the city was cancelled and Dummer erected a lath and plaster facsimile, which stood in the park for about sixty years before it was destroyed by the weather. The Buttercross itself was restored by G. G. Scott in 1865, and still stands in the High Street. It is now a Scheduled Ancient Monument. Three notable bronze sculptures can be seen in or from the High Street by major sculptors of the 19th and 20th Centuries, the earliest a monumental statue of Queen Victoria, now in the Great Hall, by Sir Alfred Gilbert (also known as the sculptor of 'Eros' in London's Piccadilly Circus), King Alfred, facing the city with raised sword from the centre of The Broadway, by Hamo Thornycroft and the modern striking "Horse and Rider" by Dame Elizabeth Frink at the entrance to the Law Courts. In 2013 businesses involved in the housing market were reported by a local paper as saying the city's architectural and historical interest, and its fast links to other towns and cities have led Winchester to become one of the most expensive and desirable areas of the country and ranked Winchester as one of the least deprived areas in England and Wales. Winchester Cathedral was originally built in 1079 and remains the longest cathedral in Europe. 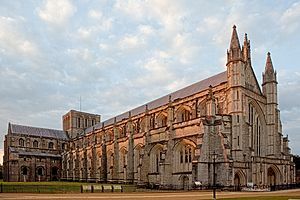 It contains much fine architecture spanning the 11th to the 16th century and is the place of interment of numerous Bishops of Winchester (such as William of Wykeham), Anglo-Saxon monarchs (such as Egbert of Wessex) and later monarchs such as King Canute and William Rufus, as well as Jane Austen. It was once an important pilgrimage centre and housed the shrine of Saint Swithun. The ancient Pilgrims' Way travelling to Canterbury begins at Winchester. The plan of the earlier Old Minster is laid out in the grass adjoining the cathedral. The New Minster (original burial place of Alfred the Great and Edward the Elder) once stood beside it. It has a girls choir and a boys choir, which sing on a regular basis at the cathedral. Entrance to the North garth of the cathedral, for pedestrians is via the Norman arches of Saint Maurices tower, in the High street. 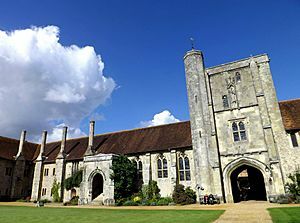 Other important historic buildings include the Guildhall dating from 1871 in the Gothic revival style, the Royal Hampshire County Hospital designed by William Butterfield and Winchester City Mill, one of the city's several water mills driven by the River Itchen that run through the city centre. The mill has recently been restored, and is again milling corn by water power. It is owned by the National Trust. Local, rural and Park and Ride bus services are provided by Stagecoach, who run to Andover, Alton, Basingstoke, Petersfield, Romsey and Fareham. Bluestar provide services to Eastleigh and Southampton. Many services are subsidised by Hampshire County Council and community transport schemes are available in areas without a regular bus service. National Express coaches provide services mainly to Bournemouth, Poole, Portsmouth and London. Winchester railway station is served by South West Trains trains from London Waterloo, Weymouth, Portsmouth and Southampton, as well as by CrossCountry between Bournemouth, and either Manchester or Newcastle via Birmingham. Historically it was also served by a line to London via Alton, which partially survives as the Watercress Line. (The closure of this line was particularly unfortunate as it served as an alternative route between London and Winchester when, due to engineering works or other reasons, the main line was temporarily unusable.) There was a second station called Winchester Chesil served by the Didcot, Newbury and Southampton Railway, this closed in the 1960s. This line provided a link to the Midlands and the North, bypassing the present longer route through Reading. In 1974 a cycle of medieval mystery plays were staged in the grounds of Wolvesy Castle. Four newspapers are published for Winchester. The paid-for broadsheet Hampshire Chronicle, which started out in 1772 reporting national and international news, now concentrates on Winchester and the surrounding area. The daily, Southern Daily Echo, covers the city in an office shared with sister paper the Hampshire Chronicle. There are two free tabloid-sized papers for the city: the Winchester News Extra and the independent newspaper, the Mid-Hants Observer. In 2003 Winchester was ranked 5th in a league of 50 'crap towns' in the UK nominated by readers of The Idler magazine. In the 2006, however, the Channel 4 television programme The Best And Worst Places To Live In The UK, broadcast on 26 October, the city was celebrated as the "Best Place in the UK to Live in: 2006". In the 2007 edition of the same programme, Winchester had slipped to second place, behind Edinburgh. A number of public figures and celebrities were students at Peter Symonds College in Winchester, including TV presenter and model Alexa Chung, singer-songwriter and drummer Andy Burrows, glamour model Lucy Pinder, comedian Jack Dee and singer/actress Gina Beck. Harlequins rugby and England rugby player Joe Marchant. Actor Colin Firth is from Winchester and was educated at Montgomery of Alamein School (now Kings' School). The singer-songwriter Frank Turner hails from Winchester, a fact that he often mentions at concerts as well as in his songs. . The band Polly and the Billets Doux formed in Winchester, and are still based in the city. 2011 saw Winchester's first ever Oxjam Takeover music festival, held on 22 October. In March 2016, Winchester was named as the best place to live in Britain. In the novel The Pillars of the Earth, by Ken Follett, which traces English historical events from 1123 C.E. 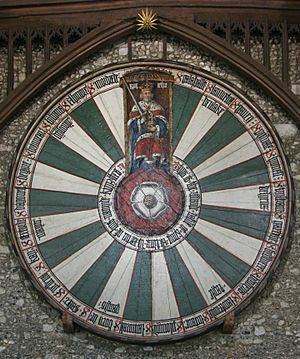 to 1174 C.E., Winchester and its cathedral figure prominently in several chapters. 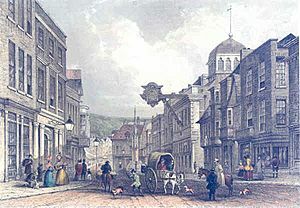 The fictional town of Kingsbridge in the novel is based on Winchester, as Follet explained in the first episode of his Channel 4 2013 documentary series Ken Follett's Journey into the Dark Ages. Accounts of wool merchants and their trading with sheep farmers in Winchester are related to the reader. The reign of Stephen is described and his military actions are recounted, including first-person "reporting" of the Battle of Lincoln on 2 February 1141. Winchester Facts for Kids. Kiddle Encyclopedia.